The DoubleTree by Hilton just off Highway 880 in Fremont offers many locations to make special images of the bridal couple. 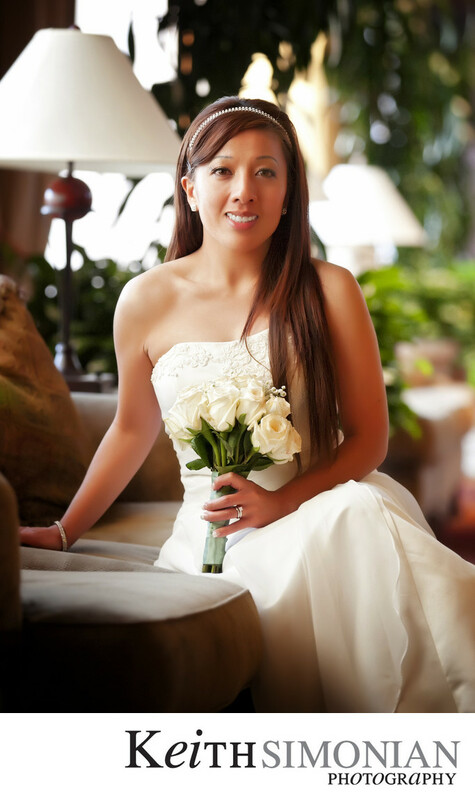 This portrait of the bride with her bouquet was taken just outside the lobby with the nice soft light provided by the large Westerly facing windows. The DoubleTree can accommodate a wedding reception with up to three hundred guests, or a more relaxed reception of just 50 people in the Bistro 880 as this couple did. Their wedding ceremony took place in Daly City at the Our Lady of Perpetual Help Church. Then it was across the San Francisco Bay to the DoubleTree for their wedding reception. 1/80; f/3.2; ISO 3200; 142.0 mm.